From a single branch of Deira, GHID has grown rapidly with many centers across multiple locations all with state of the art radiological technology, all the main imaging modalities – including open and closed MRI, CT Scan, CBCT, 2D, 3D/4D Ultrasound, Digital Mammography, Bone Densitometer as well as top rated clinical laboratory diagnostic services. Dr Mulk’s company has spearhead an AED 250 million expansion plan, which includes chain of Global Hawk Diagnostic center with dedicated PET-CT /MRI and cyclotron unites across the GCC. India and eastern Europe, Pharmaceutical industry and medical equipment Trading and a chain of Global Hawk multi-specialty Polyclinics and medical centers. The group is also looking to start a 50 bed Mulk oncology charity hospital in India and Mulk specialty hospitals in the UAE. Dr. Mulk’s passion for innovation and technology can trace its roots from his impressive education. A prominent neurovascular radiologist in the UAE, his formative medical education began at the Kurnool Medical college, Andhra Pradesh. He has completed fellowships at Michigan, USA and Milton Keynes, UK. The Customer centric approach of the business he also allowed it to expand at an exponential rate and the growth of the business also saw it being recognized. GHID was awarded the prestigious Annual Health Awards in the UAE this year, winning the distinguished Achiever award in the Healthcare and Innovative Technology. 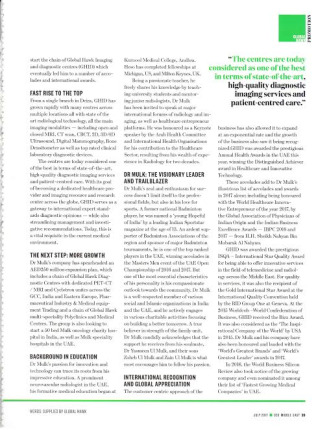 These accolades add to Dr Mulk’s illustrious list of accolades and awards in 2017 alone; including being honoured with the World Healthcare Innovative Entrepreneur of the year 2017, by Global association of physicians of Indian Origin and Indian Business Excellence awards- IBPC 2016 and 2017 – from H.H Sheikh Nahyan Bin Mubarak Al Nahyan. GHID was awarded the prestigious ISQA- International Star Quality Award for being able to offer innovative services in the field of telemedicine and tele radiology across the Middle East. For quality in services, it was also the recipient of the Gold International Start Award at the international quality convention held by the BID group one at Geneva. At the 2015 worldcob – World confederation of business, GHID Received the BIZZ award. It was also considered as the “The Inspirational company of the World” by USA in 2015. Dr Mulk and his company have also been honored and lauded with the ‘World’s greatest leader’ Awards in 2017. In 2016, the World Business Silicon Review also took notice of the growing company and even nominated it among their list of ‘Fastest growing Medical Companies’ in the UAE.